Please contact us at least 2 weeks before the scheduled date of your tour. Otherwise, it is not possible to make necessary arrangement for your tour. If you plan a trip to Japan in high seasons (December-January, late March-early April, late April-early May), please contact us at least ONE MONTH before, or preferably TWO MONTHS before the tour date. The number of cars and drivers is limited. Are you looking for a private tour to Takayama and Shirakawago? We offer various forms of private tours to Takayama and Shirakawa-go. You can choose where you visit, from where you start your tour, how long you stay in Takayama and Shirakawa-go, etc. Do you like to visit Takayama and/or Shirakawa-go with a guide? We offer private guided tours to Takayama and Shirakawa-go. Guides are available in English, Spanish, Chinese, French and Portuguese from Nagoya. From Takayama and Kanazawa, guides are available in English only. If you stay in other cities such as Tokyo, Osaka, and Kyoto, we make arrangement for the transportation and hotel booking (if necessary) for you. Hotel pickup is available only in Takayama, Nagoya and near-by cities such as Gifu and Inuyama, and Kanazawa. 1-day special offer to Takayama and Shirakawago by a private van via Nagoya, click here. Those who come from Tokyo, Yokohama, Osaka, Kyoto, please come to Nagoya by Shinkansen. If you are interested in a tour from Takayama to Shirakawago, click here. 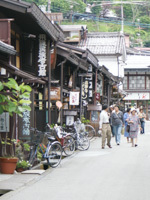 If you are interested in a Takayama City Tour, click here. If you are interested in a Kanazawa and Shirakawago Tour, click here. If you are interested in a tour from Takayama to Shirakawago / Gokayama, click here. If you are interested in a tour from Nagoya to Takayama / Shirakawago, click here. If you are interested in a tour from Kanazawa to Takayama / Shirakawago, click here. If you are interested in a tour from Kyoto to Takayama / Shirakawago, click here. If you are interested in a tour from Osaka to Takayama / Shirakawago, click here. If you are interested in a tour from Tokyo to Takayama / Shirakawago, click here. If you are interested in a tour of Takayama / Shirakawago and Tateyama Snow Corridor, click here. If you are interested in a tour from Takayama to Kisoji (Tsumago and Magome along Nakasendo Trail), click here. If you like to make a tour to Takayama and Shirakawago from Tokyo and arrive at Kyoto (or vice versa) in the same day, we arrange a special itinerary. If you like to start from places other than cities mentioned above, such as from Kobe, Hiroshima, Yokohama, Nagano, Omiya, etc., please contact us. All inclusive Shirakawago and Takayama VIP tours available from Nagoya, click here. All inclusive Shirakawago and Takayama VIP tours available from Kanazawa, click here. If you like to book a ryokan or hotel in Takayama, click here. If you like to book an accommodation in Shirakawago area, click here. If you like to buy Shoryudo Bus Pass, click here. If you like to join in a packaged tour, click here. For other requirements, please contact us. About the operators of Takayama and Shirakawa-go Private Tours, see this page.